WASHINGTON — Top executives from seven major pharmaceutical companies told a Senate committee on Tuesday they could not commit to lower the price of commonly used prescription drugs even as they admitted that they control those prices. And one executive acknowledged that the high cost of medicines hits poorest patients the hardest. Called to testify before the Senate Finance Committee, the hearing marked the first time many of the pharmaceutical executives had appeared before Congress. And they heard tough questions from senators about the rising cost of medicine and the system that allows for it. The “list price” of drugs was a central topic of interest from senators as an artificial sale price set by the drug companies. The drug companies argued that rebates, usually geared to financially benefit the third-party pharmacy benefit manager who manages the negotiation of drug prices, actually drive up costs for consumers. In a remarkably candid moment, Kenneth Frazier, chairman and chief executive officer of Merck, admitted that it’s the poorest patients who pay the most for medicine by paying the list price while others benefit from rebates. It was a rare bipartisan grilling of executives of a powerful industry who insist that prices have stabilized in 2018 and 2019. Sen. Ron Wyden of Oregon, the ranking Democrat on the committee, said that it’s up to the drug companies to lower prices. “Drug prices are astronomically high because that’s where pharmaceutical companies and their investors want them,” he said. “The brakes have come off pharmaceutical pricing, and American families are hurtling along in the passenger seat terrified of what comes next. The executives, however, said there are a series of structural impediments that prevent them from lowering costs, including government regulations imposed by Medicare. However, they appeared amenable to supporting congressional-imposed ideas to lowering costs but didn’t agree to independently doing so on their own. Tuesday was the first major hearing with CEOs on their pricing practices since Mylan CEO Heather Bresch was brought before the House Oversight Committee in 2016 to face questioning about a 500 percent increase in the price of Epi-Pens. Because the issue affects millions of Americans, tackling rising drug prices is a politically advantageous issue for lawmakers. But to implement any legislative change, they will have to battle with a powerful industry that donates generously to political efforts and spend millions of dollars trying to influence legislation. The pharmaceutical industry spent $28 million in 2018 lobbying, its most ever, according to the Center for Responsive Politics. 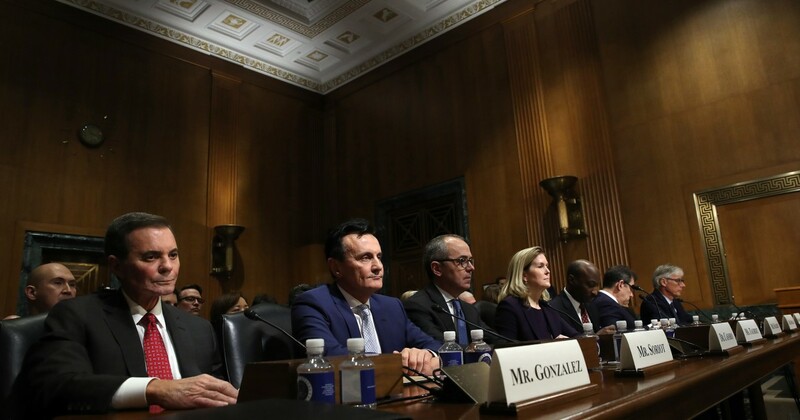 The executives appearing Tuesday, hailing from AbbVie, Merck, AstraZeneca, Bristol-Myers Squibb, Janssen, Pfizer and Sanofi, argued that there are systemic problems leading to high costs for consumers. They said they support general ideas to lower costs, including getting rid of rebates and being more transparent about pricing, but the executives also pushed back at the notion that they were solely to blame for the rise in drugs. They pointed to a statistic that consumers on Medicare pay 13 percent out-of-pocket for prescription medication, compared to just 3 percent for a hospital stay. Some senators connected the large salaries of executives or the profitability of the company to drug costs. Sen. Bob Menendez, D-N.J., noted that tax reform enabled drug companies to spend $40 billion buying back their own stock. He asked if the CEOs used any of their tax break to lower drug prices, and most of the CEOs said they did not. “It allowed us the opportunity to invest an incremental $30 billion in (Research and Development) and capital investment in the U.S. in the next four years,” said Jennifer Taubert, executive vice president of Janssen Pharmaceuticals, the pharmaceutical arm of Johnson & Johnson. Merck’s CEO Frazier said his company’s tax rate increased, and Sanofi CEO Olivier Brandicourt said his company didn’t receive much of a benefit from the tax cut because they are a French company. The hearing comes after the Trump administration has attempted to control the cost of drugs offered in Medicare plans through executive authority, including implementing a ban on rebates, which would alter the way drug prices are negotiated. Medicare recipients account for 30 percent of prescription drug spending as of 2016, according to the Kaiser Family Foundation, totaling $130 billion. The executives on Tuesday, however, indicated opposition to allowing the government to negotiate drug prices. The finance committee has separately launched an investigation into the sharp increase of insulin and the three top insulin makers, Eli Lilly, Sanofi and Novo Nordisk. Eli Lilly and Novo Nordisk executives were not present at the hearing. President Donald Trump’s Health and Human Services Secretary Alex Azar was a top executive at Eli Lilly for five years until he was tapped by Trump to run HHS. August 1, 2018 Comments Off on Charles Koch Takes on Trump. Trump Takes on Charles Koch.